A press kit, aka a media kit, is a package of promotional information about a person or company. A press kit is given to the media to aid with interviews, product (book) releases, and news conferences. Every author should create a press kit to make it easier for people to get all the information about you and your published work in one place. Plus, you can give your press kits to bloggers when you’re setting up your blog tour. TIP: You can also include links to article you've done or that are about you. Once you have everything configured in a document, save it to email to bloggers and anyone else who needs it. You can then add a page to your blog and/or website with all the same information for people who may be searching for it. Doing this is always a good idea. You can also create a downloadable press kit and add the link to your blog/website. I used Google Docs. But there are other websites that you can use. TIP: Don’t forget to update your press kit whenever you publish a new book. See: Blurbs, Excerpts, Taglines and Loglines OH MY! QUESTION: Do you have a press kit? Giveaway for a $10 Amazon eGift Card! With the start of a new school year, I thought it was the perfect time to interview Sherry Ellis. Her blog is called Mama Diaries and all of her posts feature cute stories about her kids. Sometimes her pets even get in on the shenanigans. 1. Hi, Sherry! Can you tell us about your blog Mama Diaries? Mama Diaries began in 2010. It’s pretty much a daily account of the goofy things that happen in my life as a mom. It started as a way to capture all the memories of my children’s childhood, so that I could share it with them when they’re older. I also thought it might be nice for readers of my books to get to know a little about me on a personal level. I never thought I’d get to meet so many awesome writers and bloggers by doing it! 2. I truly enjoy your funny and often heartwarming posts. Do your kids know you share the funny things they say and do on your blog? If so, have they ever asked you not to share something? Yes, they do. And yes, there have been many times they’ve asked me not to share things. On quite a few occasions, after something funny happens, one of the kids will follow with, “You’d better not blog about that!” I respect their wishes. You probably notice there are not a lot of posts about my teenaged daughter. That’s the reason. 3. All teenaged girls like their privacy. What was your very first blog post? 5. For those who may not read your posts, can you tell us a little about your kids? And your dog, Schultz, who often makes an appearance? 6. What are the top 5 most-viewed posts on your blog? 7. What do you love most about parenting? A parent-child bond is really special. I’ve been able to watch my children grow and experience life. I’ve seen their personalities and interests unfold. I’ve been there through their ups and downs. That bond that we share is what I like best. 8. Share your number one tip to bloggers just starting out. Get involved with the blogging community. Find bloggers and start commenting on their blogs. Pretty soon you’ll be building relationships, and you’ll have some terrific new friends. 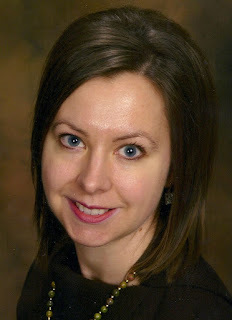 Sherry Ellis is a freelance writer and award-winning children’s author. Her books include Ten Zany Birds, That Mama is a Grouch, and That Baby Woke Me Up, AGAIN! Sherry is also a professional musician who plays and teaches violin, viola, and piano. She has appeared as a soloist in Germany and was a semi-finalist in the 2004 International Viola Competition in Paris, France. 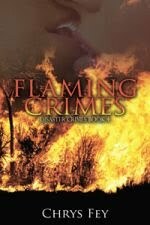 You can learn more about Sherry Ellis on her website, www.sherryellis.org. Thank you for answering my questions, Sherry! I’d love to have you back as a guest any time! My first ever author newsletter went out yesterday! YAY!!! I was thrilled about the number of people who signed up and the response I got, including how many people opened it. I love to do nature projects with my nephews. 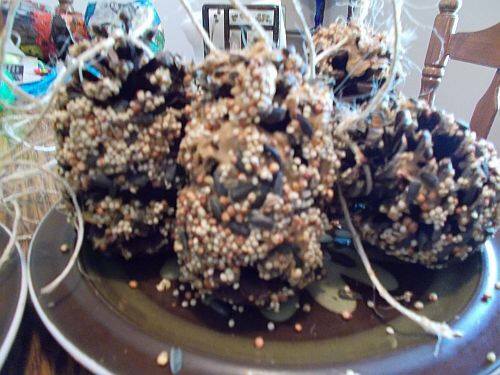 A while ago we made pine cone bird feeders. It was really fun and easy. And it’s perfect for the summer when birds are everywhere. 1. 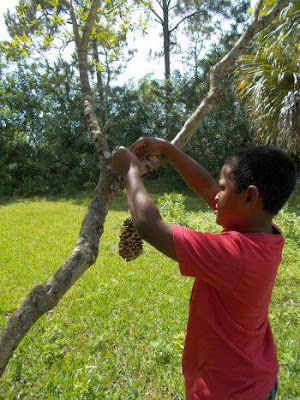 Go for a walk or hunt through the woods with your kids/grandkids for pine cones, but be careful because some pine cones can be sharp! 2. Cut about 4-5 inches of string. Tie it to the top spike on the pine cones. Keep the two ends untied for hanging. 3. Scoop out some peanut butter into a bowl. 4. Give the kids a plastic knife, place a paper plate in front of them, and have them spread peanut butter over the pine cones. My youngest nephew had fun putting peanut butter deep into the cones. TIP: Closed pine cones are easier to smear peanut butter over. My youngest nephew was very focused. 5. Once all the pine cones are coated, pour an inch or so of bird seed in a paper plate and have the kids roll their pine cones over it until all the peanut butter is hidden by seeds. TIP: Give them a spoon to help them get seeds into all the nooks and cranies. 6. 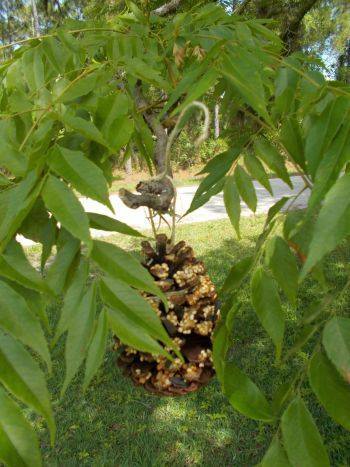 Bring the kids outside and have the pick out branches they want to hand their pine cone bird feeders from. If the branches are low enough, they can tie them on themselves or you might have to tie them on. My oldest nephew liked finding spots for them to hang. 7. Sit back, be quiet, and watch for birds. 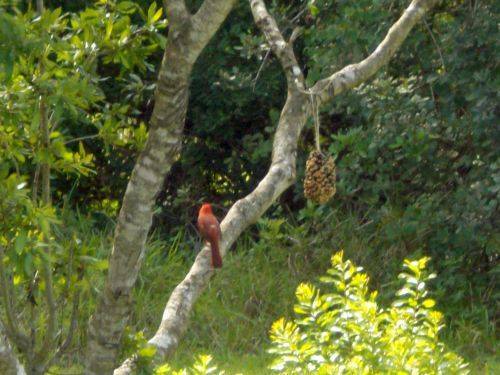 After my nephews and I put all the pine cones up, a Red Cardinal was already inspecting one. The next day, our pinecone birdfeeders were picked clean. One word…squirrels. Those dudes are sneaky and clever! If you have a lot of squirrels in your area, they may devour the goodies before the birds can. I’m not sure how you can keep them away from these pine cone bird feeders, but they have to eat too, don’t they? We saw one Red Cardinal creeping up. 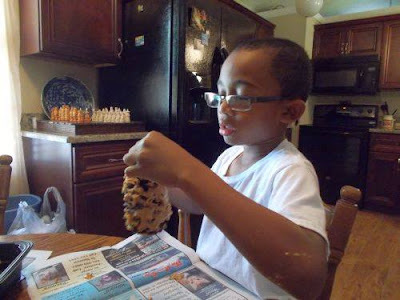 QUESTION: Have you ever done this project with your kids, or when you were a kid? I remember doing it in kindergarten or first grade. BUT YOU CAN STILL ENTER THE GIVEAWAY! $10 Amazon eGift Card when you sign up for my newsletter! Sometimes our characters need to go somewhere farther than work and the grocery store. Sometimes they need to go out of state. You could skip the plane ride, but I’m one of those writers who believe in writing everything to make the story realistic. You don’t have to, though. You can start a chapter with your character(s) in the airport after their flight, or you can write out everything but skip the flight. It’s up to you, so take a look at my 4 steps below and pick which phases you want to write about. People: If you’ve ever been in an airport, you know how chaotic it can be. People traveling for business hurry past with their suitcase in one hand and a briefcase in the other. Families traveling for a vacation crowd together, loud and loaded down with luggage. Tourists, whom we get a lot of in the Orlando International Airport, clutter in packs and often speak a foreign language. Then there are the watchful security guards and pilots walking by in their crisp uniforms. Size: Airports are normally huge and you often have to go from one section/floor to another to get to your gate. I once got lost trying to find my luggage! So make sure to mention the size and even let your frazzled character get lost, too. Waiting: And then there’s the waiting, which is what everyone does in the airport. Show your characters impatience and what he/she does to consume the time. The take off is actually the most exciting part of a plane ride (unless, of course, it crashes). The plane moves onto the runway with a gentle gliding motion. When it picks up speed, the plane will bump and rattle you around, and when it lifts up, you’ll get pushed back into your seat. After a few minutes, the plane levels out. You can describe the shrinking roads, cars, and houses as the plane rises, and the look of the clouds from the window. TIP #1: If you want to write about a plane crash, read reports, books, and watch as many movies/documentaries as you can to understand what would happen. TIP #2: Consider whether or not your character is afraid of flying. If so, show his/her fear by having him/her clench the armrests, take Valium, pray and/or jump at every little thing. What does your character do during the flight? Sleep, read, or watch a movie? You don’t have to detail every minute of the flight, but mentioning what your character does is a nice touch. 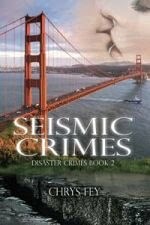 You can also describe the turbulence that bounces your characters and their belongings. Usually the landing is smooth but it can also be bumpy. After the landing, follow your character through the airport. Once he/she is outside, you can begin the rest of your story and the purpose for the trip. QUESTIONS: Are you afraid of flying? Have you ever traveled by plane? Where did you go? I’ve only been to Michigan, but I traveled there by myself from Florida when I was seventeen and it was my first time ever on a plane. I’m usually afraid of heights, but I did good! MY FIRST NEWSLETTER WILL BE GOING OUT TOMORROW! Giveaway for a $10 Amazon eGift Card when you sign up! You can also invite someone to sign up for my newsletter to get extra points. You can do this once a day to the end of the giveaway, but I will be checking to make sure your friend really did sign up. You should plan your blog tour the moment you know the release date for your book. Heck, start planning it when you’re editing with your editor. You can’t really start too soon, and the sooner you start, the less you’ll have to do and worry about later. You can sign up with a blog tour for a price, but if you can’t afford that, you can do it yourself. This post is full of advice for authors wanting to do their own blog tour. 1. Look at the blogs you already follow. 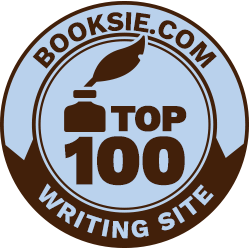 Chances are many of them host authors and accept guest posts. Find an email address and send the blogger a kind inquiry about being a guest. 3. Check out this website: Book Blogger Directory for another list of book blogs. You can even search under specific categories. 4. 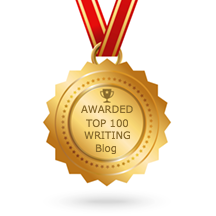 Pay attention to other author blog tours. 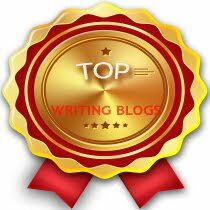 Sometimes there are lists of blogs the author will be going to next. 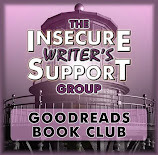 Check them out to see if the audience is right for your book. 5. Set up a sign up form with Google Form and make an announcement on your blog politely asking if bloggers would like to help you out with your blog tour. 1. Is the blog current? If the blogger hasn’t posted in a year that blog will not be worth contacting. 3. Do the guest posts receive comments and shares on Google +, Facebook, and Twitter? If there isn’t so much as one comment or share, it’s not worth it. 5-10 comments and shares (or more) is a good sign. Once you find potential blogs, make a list of the blog’s name, URL, the blogger’s email address, and what type of guest posts they accept. About two months before your release date start emailing them. When they reply back and agree to host you, schedule a date for when you can appear on their blog and establish which type of guest post they want (author interview, etc.). TIP #1: Make each post unique. Don’t just have everyone post the blurb and excerpt. Add a Tens List or a small paragraph on a subject that relates to you, your writing, your book, or your characters. Create your posts/complete the interviews, and send them to the bloggers with your author photo, cover art, and media kit 1-3 weeks ahead of time. TIP #2: I like to include HTML codes of a complete post so the blogger doesn’t have to do extra work. Set up your guest post on your blog with the pictures and links you want used. Then get the HTML code. If you use Blogger, just click “HTML” above your post. Then copy the entire code and paste it in the file you will be sending to the bloggers hosting you. TIP #3: Make sure to get the new code for every guest post you create. Many bloggers don’t know what to do with the HTML code, but it’s easy. Again, if you’re using Blogger there are two buttons at the top of a new post. These buttons are “Compose” and “HTML.” Click “HTML”, paste in the code, and then click “compose” to make sure everything looks okay. Then schedule the post as you normally would. TIP #4: Giveaways attract more people. You can create a Rafflecopter giveaway with some swag. Try not to offer a free copy of your book though, because during your blog tour you want sales. TIP: Add your blog tour links to StumbleUpon under the “Books” Category and share them on social media. But don’t bombard your followers. Share only the best posts (character interviews and things you think readers will find especially interesting). QUESTION: Authors: How do you do your blog tour? Giveaway for a $10 Amazon eGift Card when you sign up for my newsletter! Please welcome the wonderful Elizabeth Varadan! She is answering questions about Imogene and the Case of the Missing Pearls, a Middle Grade book featuring Sherlock Holmes! Ten-year-old Imogene, the daughter of a banker, harbors a secret desire to become a detective – an unseemly notion for a Victorian girl. A day after her obnoxious step-cousins pay a visit, her mother's pearls go missing. When Sherlock Holmes is called in, Imogene sees her chance to learn from the great Mr. Holmes. She hangs around asking questions until Holmes decides to make her his assistant, telling her to list things that seem suspicious. Rusty, a mudlark and Mr. Holmes’s messenger, brings a message from Mr. Holmes’s message to the kitchen doorway. Rusty and Imogene become friends, teaming up as sleuths to find the missing pearls. But Imogene is headstrong. 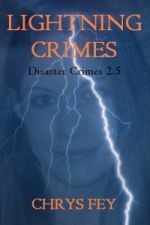 When she takes matters into her own hands, soon her life is in danger. Free shipping worldwide: Book Depository. 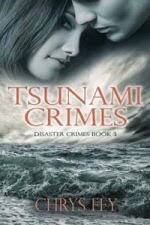 E-book format: Kindle / Kobo. It will also soon be available on iTunes. My husband and I are both fans of the Sherlock Holmes stories and novels. I’ve also enjoyed several of the “pastiches” that abound, mysteries that use the characters of Holmes and Watson, and even Mrs. Hudson, the housekeeper. When I had a chance to visit the Sherlock Holmes Museum in London a few years back, it occurred to me that it would be fun to write a story of my own about Sherlock. I didn’t think much about it after that, as I had other works in progress. But then it occurred to me it would be fun to write a story about a young Victorian girl becoming friends with Mr. Holmes. After that, the idea just grew into a mystery – I suppose because any story involving Sherlock would have to be a mystery. So then it became a matter of what kind of mystery? It would have to be an inside job, as Victorian girls weren’t allowed to go anywhere on their own to explore anything without a chaperone. Once I had that rough setting, it was a matter of researching the era and having fun with the plot and characters. 2. I love that your young character learns from Sherlock Holmes. Is this book part of a series? I do have at least two sequels planned. 3. That's great! 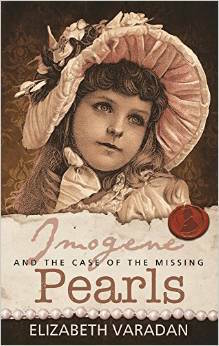 Did you do special research for Imogene and the Case of the Missing Pearls? Oh, for sure. Tons of research. I visited sites, wrote letters, studied train timetables of the year in question, perused maps. But I love research, so it was part of the enjoyment of writing this book. And now I have all that information for the sequels. 4. How did you come up with the names for your characters? Well, Imogene came from my own ten-year-old yearnings to be Nancy Drew and the name I picked for my fantasized detective self. Rusty’s name seemed a natural, once I had described him as “ginger haired” (the British description of red hair). 5. What is Imogene's biggest weakness? She’s pretty headstrong, once she gets an idea into her head. And Sherlock also has to remind her that a good detective never lets emotion cloud judgment. You’d be lucky to find anything in my desk. It’s usually a real mess of dictionaries, pens, post-it notes stuck all along the edge of the shelf, cards, stacks of notebooks. But – I know where everything is. 7. Sounds like a writer's desk. ;) Can you tell us about your journey to publication? I did self-publish an earlier book, a middle grade fantasy called, The Fourth Wish. But I wanted a traditional publisher for this one. And, in the United States, you have to get permission from the Doyle Estate to use the characters of Holmes and Watson, as the copyright hasn’t run out in America. The lawyer for the estate in America is Jon Lellenberg, and he was very helpful at every turn. He actually suggested MX Publisher, as they focus on Sherlock Holmes related books. 8. That was very nice of Jon! What is the silliest thing you ever did while writing a story? 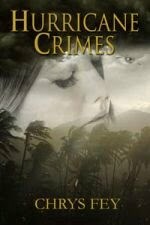 I was writing a mystery for adults that involved a woman being kidnapped and held hostage in a cabin in the mountains. To figure out how to describe her escape via a window, I climbed out of the window of a duplex my husband and I were living in at the time – several times! We were new in the neighborhood, and I was thankful that everyone in that little cul-de-sac seemed to work during the day so that no one could report me to the police. 9. 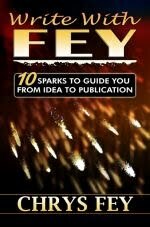 Your advice to new writers? There is no substitute for the magic of rewriting, rewriting, and rewriting. A knack for storytelling is just the beginning. You have to keep polishing and refining your work until you get it right. 10. Rewriting is necessary and important. Tell us about your writing process. Hmm. It’s really a hodge-podge. Sometimes I’m a panster; sometimes I outline, but that’s often after the book has been written and I’m re-writing. Then I outline what happened the first time around to see where the holes are; sometimes I just scribble down ideas and then put them in a file to look at later. Elizabeth Varadan is a former elementary school teacher. She taught most elementary grades, but her favorites were the middle grades, and she now writes middle grade fiction. She and her husband live in Midtown Sacramento, California, a beautiful tree-lined neighborhood with bookshops and art stores nearby. 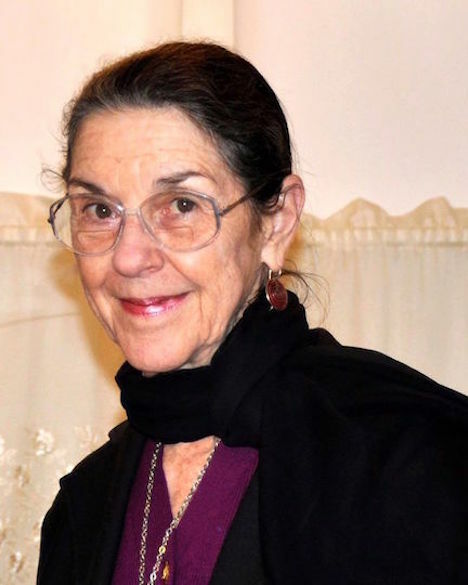 Her children’s fiction and poetry have appeared in Ladybug, Friends, and Skipping Stones Magazine. Her adult flash fiction has appeared in several online and print magazines, and her poetry has been anthologized in Vine Leaves Journal and The Stray Branch. Thank you Elizabeth for telling us about Imogene!